Crop circles - Reasons, chronology. Explanation, decipher, decode, discovery, break code, explaining, decryption, puzzle out, scientific research. Translation from text published in 28th April 2011 in www.sarden.cz (czech internet sci-fi magazine) into english. Not native speaker. Sorry for that, please. The first article, the first introduction to the general public with the results of several years research in the crop. First of all will be defined substantial number of terms. The very first thing will be "Crop circles" renamed to "Crop Patterns" because they are not only circles. At a certain stage of the research there was a tendency to rename it to the "Field Pictograms" (FP), since this effort was abandoned for a very simple reason. Pictograms are images that transmit and communicate certain information. As is apparent from the following text, "Crop Patterns" transmit absolutely no information, although sometimes it really seems they do. In such cases, whose statement was subsequently "solved", with relatively high reliability that was a fake. Examples include "Message from Chibolton" - 21.8.2001, or Crabwood - August 18, 2002, or "Configuration PI" - 1.7.2008, Barbury Castle, certainly very difficult, yet by human forces realizable figures. However, due to it is a relatively experienced term, somewhere in the following text will be for patterns used a steady common abbreviation Crop Circles (Crop Circles). 1st Crop circles are not produced even by people nor by aliens, they are only a result of purely natural phenomena. Physics, chemistry, biology and other related subjects. It is even possible note that all patterns in the grain can be considered as a result of thermonuclear processes (to be explained). 2nd Possible say, that occur in this area, although very rarely, to produce fake. As fakes are identified patterns made by people, so-called circle makers. Since, however, from a statistical point of view are all such sporadic fakes absolute exemptions, which falls far below the area of statistical errors - as explained in the very next point, in the following text will appear about that almost no mention. Aside from the odd exception (statistical). 3th Although it may seem the least bit likely, such hoaxes are in fact only a tiny fraction of a percent, much less than one thousandth of totally discovered and undiscovered regular or irregular patterns. Certainly much more than 99.999% of all patterns ever in crop existed, also in future, were caused (and will be) by purely natural, earth forces. Such disclosure very strongly contrasts with almost any movie or TV show, paying attention to the Crop circle problematics. Absolutely, without exception, in any such program perform an individuals or groups of people with planks and ropes, who seemingly engaged in the manufacturing of such hoaxes, making certain groups of observers repeatedly conclude that it is the only true way of their creation. Statistical studies show quite clearly that in the presence of film or TV cameras and crews many times (several orders of magnitude) increase in the number of different blockheads present near such a place. Just look at any broadcast from Parliament (cz). It is important to remember especially the fact that anyone in any film or TV show performs, gets a reward, and his face would be seen for a brief moment by at least hundreds of thousands people. For some multimedia exhibitionist the second is the reward most required. In the cases described (forgers of patterns) at most (thankfully) the first and last. In any other field of human activity would be such a similar fake been detected easily after entering the real author, forger so once and for all exposed and ridiculed. From the very simple reason that results from the following text, will the right and only one real originator of patterns appearances in crop never confess, probably because of his innate modesty, so it is necessary to do it for him by someone else. But if by chance, the real author with such forger imitators has met, which would sometimes really happen, he is able to carry out such "performation" or "fireworks", that would have certainly almost nobody ever thought to follow them. Since would be that simple-minded-circlemakers after any such meeting until charred slightly burnt, such a meeting will nobody in any case wish for them definitely. No choice but strongly encourage them: Be so kind, and rather sit in the pub and pay with consummation (mostly drinking, that's your job). Otherwise you could end up like this... Your contribution to humanity in both cases would be approximately similar. 4th Patterns in crop (even the most regular) is possible, indeed even necessary, specify as lodged (damaged, weakened) crop. In terms of visual observations: "crop, whose stems, in contrast with the usual vertical growth direction lies horizontally or almost horizontally." In terms of agricultural - farming it is primarily "crop partially or completely damaged by lodging (damaging, weakening) (difficult or completely not possible to harvest)." 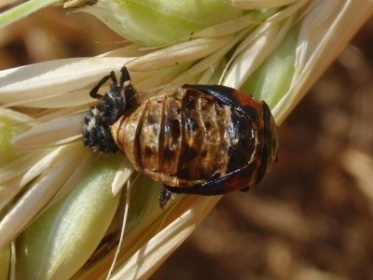 From the same perspective, in many cases it contains significantly higher extent of grain pests in contrast to surroundings, also may be degraded due to a greater degree of moisture. Aside from the odd exception occurs all lodged (damaged, weakened) crop, not only that in regular patterns, almost by identical manner. Crop is lodged (damaged, weakened) because weakened, bends to the ground (lodging (damaging, weakening), flattening (damaging, weakening)) thanks to this weakness, that occurred only after its injury, never vice versa. Crop was first damaged (at first without any observable consequences), and only as a result of this damage occured to its weakening. Usually very slow (days to weeks, often more), and then eventually lodges (sometimes not even that). 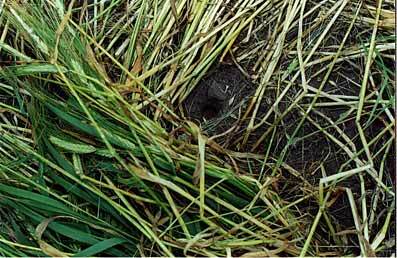 Healthy, undamaged and unimpaired crop lodges almost never. All lodged (damaged, weakened) crop everywhere, even regular patterns, also any irregular lodged (damaged, weakened) areas, perform exactly the same characteristics - bent, thickened and prolonged nodes, also mostly (over 90%) unbroken stems - bent closely over the ground. Also various growth anomalies (mostly in entirely statistically insignificant amounts). Some time after lodging (damaging, weakening) plants try again stand up back to the vertical position, and that less damaged are partially successful, others not. In the first case is possible to observe bended nodes, in the second their prolonging. Some crop circle researchers believe, that an action of some kind of very indefinitely defined forces (microwaves, infrared radiation, vortexes, minitornadoes, whirlwinds), that were in field never seen in action, nor is their presence failed to prove by any objective observation, AT FIRST becomes an extension of some and bending of some other nodes, and only AS A RESULT of such plants damage becomes flattening (damaging, weakening). ALL SUCH RESEARCHERS MUST BE ONCE FOR ALL DISABUSED: The extension and bending of cereal stem nodes, or any other individuals of the family Poaceae, nor any other plant, becomes NEVER, NEVER, NEVER, before lodging (damaging, weakening), but EVERY, EVERY, EVERY time after that. It occurs (extensions and bendings of the nodes) mainly due to geotropism (negative), when plant lying horizontally tries again stand up to the vertical position (they manage it using the nodes, one of whose function is leveling deviations from the vertical growth - negative geotropism). Similarly acts plants without nodes, and by increased growth, also count of cells in certain parts of the stem or trunk they reach a permanent change of growth direction. One of the basic shortcomings of almost all previous Crop Circle surveys, is the fact that their explorers very quickly and sometimes very spectacularly invited to help almost all the world's existing mystery-experts, ufologists, astrologers, esoterics, dowsers, occultist, numerologists, diviners, psychotronics, fortune-tellers, sorceress, witches and various additional "experts" of similar orientation. One or two fields of human activity, science and knowledge, probably mainly in intoxication, dazed by mysteriousness of that observed supernatural phenomena, they almost managed to forget. Forgot invite experts from the field, who would to the whole issue certainly "bring a little of knowledge" to the solution of such a complex problem. Forgot the one area of human activity, which, although it does not seem, can yield to the issue of crop patterns the best explanation, unlike all listed. Forget namely ... the botany and agriculture. This paper, therefore, through a new, relatively complex interpretation of the whole phenomenon, is trying this rather startling and sad fact at least somewhat correct. 5th The cause of the damage arising from the subsequent weakening, is the the electric energy (current conducting through plants), and the one who delivered it was the lightning discharge - Lightning Stroke, especially its most important (and strongest) part - the Return Stroke. A more detailed description of the principles, process and energy of the lightning discharge would greatly exceeded the expected range of this article and any potential interested person must be referred to the literature. 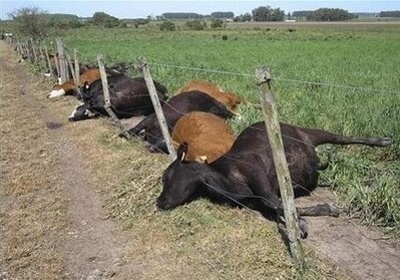 The lightning discharge damage is the cause of many cereals and other field crops and their subsequent weakening and lodging (damaging, weakening), as well as on pasture grasses and any other grass, and similar vegetation also not appearing in the fields. The vast majority of such flattened (damaged, weakened) areas will occur as irregular shapes - Randomly Downed Formations, RDF. Few million square kilometers of damaged plants flattened (damaged, weakened) annually across the globe. 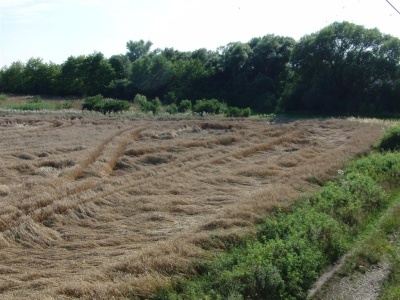 For comparison - lodged (damaged, weakened) crop surface, caused by so-called "circlemakers" amount to several hundred square meters per year (or even nothing), which is the order of about one ten millionth of the area, resulting from natural processes, without any intervention of such imitators. Regular patterns, called Crop Circles (genuine - naturally caused), are round one millionth of RDF areas appearing whole world yearly. 6th During a lightning discharge into the field in many cases a considerable discharge power long time before completely conducted underground immediately extends for a very short time into the neighborhood. Thanks to often wet and therefore substantially more conductive earth's surface, especially in tractor tracks and their immediate vicinity, up to a distance of several hundred meters or more, and then still passes evenly underground. Some small part of the discharge energy is thus transferred also in relatively distant plants or their root system. This will provide in them noticeable amount of harmful chemicals, during time can occur weakening plants in all these places and subsequent lodging (damaging, weakening), very often long or even very long after the storm. Thus nobody connects observed effects of weakening and flattening (damaging, weakening) with thunderstorm and lightning, many days, weeks even more two months ago. 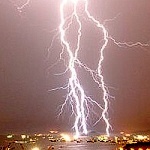 Described extension of lightning energy overground is so evenly that more distant it may not represent a greater danger to the higher animals, except for locations close to the discharge, which are very dangerous anytime, of course. Usually it happens that the first become flattened (damaged, weakened) locations closest discharge, and in time towards them gradually accruing more, less damaged, which may continue until harvest. The first picture is a place, where in the vicinity was recorded on the 24th May 2010 at approximately 5:51 p.m. CEST 22kA lightning discharge, and at a small distance from it for 8 others, ranging from 16 to 58 thousand amperes, all within less than a minute. 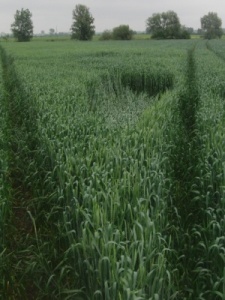 The picture was taken three days later, 27 May, still not noticeable any signs of flattening (damaging, weakening) crop, X marks the spot from that was captured the second shot. It was recorded on the day when the lodging (damaging, weakening) appeared first - June 3, ten days after discharge. The third shot from the same site was taken two months later, on August 1, Several hours after the first visit of this lightning site, after taking the first images of lodging (damaging, weakening) at that place, was detected damage of the camera memory card and a total of 21 images have been nonrenewable deleted. Several hours before data loss (in the evening on the same day) images were proven on the card. After damage (detected next morning) was not possible to store data on that card in its original extent, memory cells were irreversibly destroyed. It is possible that described effect would be participated by residual static electricity, persistent somewhere in isolated locations underground. Such a presumption would be necessary verified objectively by measurements on that site. An undeniable fact is that during the examination of patterns is sometimes really measured increased amount of electrostatic charge in the exact place of their appearing. Much more often some microelectronic devices of frightened Crop Circle explorers (mobile phones, cameras, videorecorders, MP3) behave exactly as if some increased amount of static electricity really was there. Is also possible that there is located nothing like that at some impact points of the lightning discharge in the field, but the layer immediately below the ground surface during the impact of the lightning discharge behaves similarly, as the dielectric of the capacitor. It is a relatively non-conductive subject, compared with the surrounding like an insulator, that lies on a layer much more conductive, which could be mainly aquifer (second, the bottom electrode of the capacitor; upper electrode is the wet earth surface). During the impact of the discharge there occurs a dielectric breakdown, therefore to the conduction of power relatively quickly down to the underground, without further spreading on the ground. Discharge thus again just reminds conductor current, placed vertically above the ground and passing through it underground. In such a case may be even much of the plants around it hit only by the electric induction (such plants can be defined by a quite precisely circle). Plants in the immediate vicinity of the lightning discharges also may be affected by corona discharge, which occurs in close proximity from the lightning channel to a distance of several meters, in case of extremely strong lightning discharges up to tens of meters, and defined again by relatively accurate circle. Corona discharge forms in the event of lightning something like a weakly shining cover of the discharge, and is possible to register it on some lightning photos. But nearly always overexposed by the main discharge (Return Stroke), which is really a gigantic process, beyond any ordinary human imagination. By the action of lightning discharge directing perpendicular to the center of the globe can be explained even seemingly incomprehensible fact, that although on some inclinated fields are formed the oval (elipsoid) figures, but when observed from above during aerial photography appears to be fairly accurate circles. Also possible to imagine, that non-perpendicular lightning discharge may participate on emergence of some partly-shaped circles. Half circle, semi circle, half-moon and so on. 8th In the previous section defined structures (helping conduction lightning underground without its further spreading into the surroundings over ground surface, something like an natural underground lightning rods) could also relate to some archaeological sites, many of which occur in places so-called Cropmarks, Soilmarks or Frostmarks. Their detailed characterization would greatly exceed expected scope of this paper, so perhaps another time, or elsewhere. It is possible that an underground formations that occasionally cause appearances of listed phenomena (Cropmarks, Soilmarks or Frostmarks), indeed, sometimes partly may contribute on the emergence of some patterns (some parts of the patterns can arise with their contribution). The sad accompanying fact of Crop Circles phenomenon research seems be the reality, that on places, that to these phenomena should be paid to the most, especially various web pages about the issue of Crop Circles, there is not located about them of almost the slightest reference. 9. Stuck poles in the center of patterns. After the discovery of some patterns explorers often find, that in the center or close to that is possible to find something, what can be considered as the place, where was previously a bar stuck to the ground, from which resulted a string, etc. Without hesitation, then mark such a pattern as a hoax, made by people. "How is it possible, that here secretly attempted create a ring someone so stupid, planted a pole to ground, created a circle, pole pulled out without covering the tracks after that, so as to inadvertently reveal just to the first visitor?" "Hah-hah-hah, even if you discover me, finally never, never, never, anybody able to catch me." The possibility of effect "stuck rod" by the lightning discharge is demonstrably possible, at the time of the discharge its channel width does not exceed 5 mm and the energy passes through it, to which the electric locomotive would travel several thousand kilometers. On the example is possible to see, what may be mechanical effects of lightning discharges. Discharge went through the "underground pipe", which may be at a depth of about 1 m even more. How, then, may seem a trace of lightning discharge, which continues after the contact with the surface directly straight down underground? The forehead of the Return Stroke (by the way, moving at the speed of one to two thirds of light speed) could be compared to at most the size box of matches, which contains energy of electric locomotive (and weighs about as well as many). Just look at any other photo, on which are recorded the mechanical effects of the of lightning discharge impact – damaged and broken trees, broken like toothpicks, and scattered like matchsticks, wires torn from the wall, punctured roofs – and recognize, what happened on the site, what thermoelectric, thermomechanic and electromechanic processes were taking place there. Deviations of the compass direction from the normal? After passing through the current several hundred thousand amperes near any magnetizable material this material remains for a long time - weeks or longer - noticeably magnetized, magnetized everything up to several tens of meters away, magnetic pulse is incredibly strong. In every field there is a certain amount of iron (not only abrasion of agricultural equipment, fallen iron parts) as a metal even in the form of hydrated oxides. Test item becoming magnetised lightning conductor serves as a relatively accurate indicator of the current, throughout that it passed during the discharge. Under many fields of corn is quite a lot of metal structures, manufactured from ferromagnetic materials (water and other pipes). Some irrigation pipes, conducting overground, can also act as a lightning rod and be affected by lightning and magnetized. The average natural iron content in the arable land is about 30 g/kg. Also see LIRM, wiki. On the site occurred some time ago enormous, absolutely unimaginable electrostatic charge. Not only that, by what deflect the teachers in physic lessons fibers of electroscopes (order of mikrojoules), but gigajoules, also much more, thanks to that would electric locomotive travel thousands kilometers. A small part of it may be still hidden not very deep in underground. Incidentally, in the instructions of each microelectronic device is written with thick letters something like: "May cause problems under static electricity". People who have ever stayed near the van der Graaf generator (hundreds thousands to millions of volts) have observed all the microelectronics functions failure, shutdowns, restarting. During visit of any crop circle are observers present at a place, where it seems some time ago to work together several billions of greatest vdGg, constructed in the world ever. To achieve voltages and currents, that occur in lightning discharges, would not even add several millions of Temelin power plants at the same time (200 MW generator would supply at one million volts 200 A, in the words two hundred amperes, compared to several billion volts and two hundred thousand of amperes less than a millionth; two hundred thousand amperes is a current, although not average, but quite commonly occurring lightning, regardless the fact that several times a year are measured lightnings, with only "slightly below" million amperes). How is it possible that some patterns are so unimaginably complex, seemingly not producible by any procedure? At that participate mainly two physical phenomena: resonance and interference. At the point where the lightning discharge appears, take place unimaginably powerful physical processes (and incredibly rapid changes), mechanical and electrical. Processes beyond any ordinary human imagination. There are of potential differences millions to billions of volts, currents of tens to hundreds of thousands amperes, rising edge steepness of electrical pulse is hundreds of thousands of amperes for a single(!!!!!) millionths(!!!!!) of second, forehead of the main pulse (Return Stroke) speed is moving 1/3 -2/3c (100-200 thousand kilometers per second). Immediately after the impact of each discharge occurs exactly at the point of impact noticeable local micro-earthquake of magnitude 3-4 (does not cause any damage, if it were not thunder, it would be hardly noticeable by human senses). Even before the impact of discharge to the ground is beginning to disseminate from there great air pressure (sound speed) and shock (supersonic) wave, and from there the speed of light is disseminates extremely strong impulse of electromagnetic radiation, almost of all wavelengths, which has no equivalent in the physical practice. Among all these phenomena in the case of parallel and subsequent discharges hitting a few meters to tens of meters from each other take place hardly imaginable resonance and interference. Certainly there will never exist any researcher, who would try to measure something there. Such explorers would have very short shelf life and had to be frequently rotated. In some previous paragraph was shown, that under certain circumstances, some patterns would resemble patterns in metal shavings produced while passing of current through the conductor. Even a single common crop circle pattern is very reminiscent to a pattern, created by iron sawdust scattered on the board, through the wire leads perpendicularly, passed through by electric current (magnetic field of a straight wire). Here is possible to remind, that at the moment of lightning discharge within a distance of several hundred meters, also such non-magnetic material as crop stem, can behave like a normal electromagnet and exhibit magnetic properties, it is passed through by an electric current induced. It is delayed only by the speed of light, which is one millionth of a second over a distance of three hundred meters. All thanks to electromagnetic induction, some next current could pass through them a little time before (seconds), due to the electrostatic induction. Finally will be connected a little prognosis of sites, when and where this year (2011) will appear patterns in the crop. Of course it will be a very general prediction, not precisely particularized, but something would be indicated by that. Only where there were storms, nowhere else. More specifically, where lightning discharge passed directly into the ground, ie, cloud to ground discharge. Simply ask meteorologists, they have those records registered many years backwards (Aldis, Celdn, Nordlis, Euclid and others). By the way, their records are very accurate, the time when the discharge occurred is recorded with a precision greater than a thousandth of a second, and localization in some cases even more precise than tens of meters (But some lightning bolts are many times branched, so that consequences may be observed in relatively large distances from measured - average impact point). Meteorologists are naturally modest people, and do not announce at all times and everywhere in the world, that are able handle something like that, unlike some mentally unstable and deviated individuals. Only after the storm. But for a significant number of cases even very long after the storm (usually around 10 days, even more than two months). The common feature of almost all lodged (damaged, weakened) crop, both in regular patterns, or completely irregular shapes, is the fact, that the primary cause of crop lodging (damaging, weakening) is the lightning discharge. 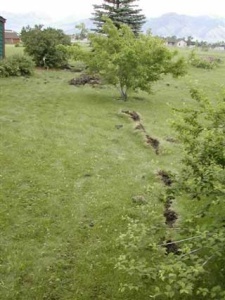 The lightning energy immediately after contact with the ground is not very often conducted directly perpendicular to the ground, but before that is significant part of it "scattered" or "dispersed", most often in tramlines and near that, and only then with a little delay definitely moves underground (where still meets with the root systems of plants). The actual physical principle of increased electrical conductivity of the wet ground, and even higher conductivity of muddy tramlines, which holds the most moisture, compared with the layers immediately arround them, containing significantly less moisture, and due to almost non-conductive, so there is not many other opportunities for conducting electricity. Seemingly cause almost no damage, except that in the plants is created an "excess" of harmful chemicals and microscopic registrable visually damaged tissues and cells. Almost never flattening (damaging, weakening) occurs immediately after the discharge of lightning, in a matter of minutes to hours, but takes place after several days, more often weeks, sometimes not enough for an entire month, it is necessary wait two or longer. It is not impossible, that the great majority of crop lodging (damaging, weakening) appearances, that occurred very shortly after the storm, was characterized mainly by that, that the plants would have had a few weeks before "been prepared" by a completely different lightning discharge, but no one able to remember. The process of weakening and degradation of plant tissues after passing electric current through it is very slow, it is a process of biological, physiological, and takes many hours and days, in contrast to chemical and electrochemical processes that took place after discharge in seconds to minutes, and physical processes - induction and conduction of electricity, all of which occurred during the discharge, which did not last longer than a thousandth of a second, or the time immediately following, which did not last much longer. The process of induction carried out at light speed, process of current conduction somewhat or more slower. 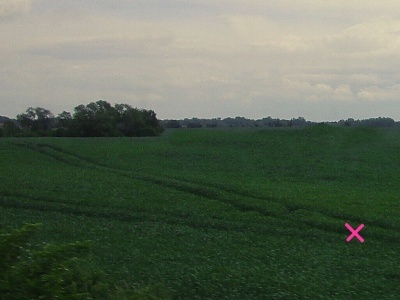 The probability that the crops flattening (damaging, weakening) is in some way involved in electrical energy discharges, that are partially spreading in the tramlines, demonstrably and significantly increases the observable fact (just look at Google maps or aerial photos from anywhere round the world, captured in a period of growth and ripening crops, and any Crop Circles photo, where also RDF appears), that lodged (damaged, weakened) crop actually in the largest number of cases follows the direction of the tramlines, and most commonly occurs near the tramlines nearest to the border of the field, which have the highest conductivity (are multiple traversed and tractors are turning round near that, often with the differential gear turned off). lodged (damaged, weakened) crop also rarely crosses borders of the fields, that are quite reliably galvanically separated from each other (ditches, ways, balks, paths, alleys). Certainly possible due to some parallel discharge, hitting the nearby field, too. Incidentally, this year (2011) spring storms in Britain were probably in a smaller extent than usual (at least in places with the most frequent Crop Circle appearing), thus is not impossible that so popular "yellow rapeseed season" will be this year substantially weaker than some past years. That would be all at the beginning, continued sometimes in a forthcoming work. There would be possible for example explained the formation principle of the simplest pattern - circle, but also more complex patterns - two systems of concentric circles, partially intersecting, and their interference (analogy of circles on the water). Despite what has been explained here, that's not all, and by far the most important, in addition to electric current, which is indeed root cause of all, but works in conjunction with many events and phenomena, whose principles will be clarified yet. They will be described the most important physical, chemical and biological processes, that contribute to the origin of lodging (damaging, weakening), in what order and times they approximately take place. In the paper, which could follow then, will be described a phenomenon, recounted never before. Never discovered and explored, regular and fairly typical pattern in crop (Czech Republic). It is not just only a circle, very similar, almost identical shape patterns has also been discovered in Germany, Italy and Britain, varied only in size. This supports the theory, that in their formation may participate some very similar physical principles, and not only those. Not published figure was captured fully unwittingly by means of aerial photography, Never on that place investigated by any explorers, discovered until several years after shooting, only on the photo. Not happen the same thing to it, what about since 2006 accompanied by some mysterious reason, almost all of its predecessor, companions and followers, that are almost without exception in one on the page www.cropcircles.cz identified as "probably hoax", or rather "hoax", most probably due to a "hole after stuck pole" in the center of the pattern, and the next thing nobody pays them any attention. Yet all but a relatively high probability all may be a patterns, that were not created by any crazy sleepwalkers, stumbling by night around the fields with boards and ropes. Do not believe? After that might follow a contribution Lines in the Crop. Or vice versa.